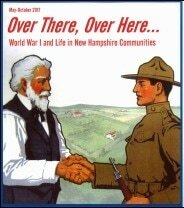 Over There, Over Here: World War I and Life in New Hampshire Communities was awarded the Local History Award for 2017 by the Association of Historical Societies of New Hampshire. New London Historical Society was one of 13 area historical societies participating in this yearlong collaborative. The MUSE (MUseums Sharing Experiences) group sponsored a multi-organization exhibition in 2017, Over There, Over Here: World War I and Life in N.H. Communities. A multi-group collaboration, this program commemorated the 100th anniversary of the United States’ entry into World War I. The goal was to put the war in social context exploring the themes of the lives of service men and women, Native American code talkers, the development of camouflage and chemical warfare, communication tactics on the battlefield, the war relief effort, changes on the home front, temperance, women’s suffrage, the Influenza epidemic, and the profound changes in music, art, and literature. The New Hampshire Historical Society created a series of lectures and exhibit on this period in time. What does Instant Coffee have to do with WWI? In the trenches, Instant Coffee gave troops a much-needed boost!